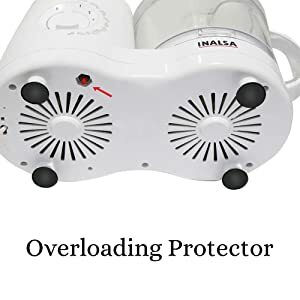 Amazon's Choice for "inalsa food processors"
Child Safe Interlocking System:No motor operation till jars and processing bowl are not properly fitted and locked. Over Heat Safety Protection:Automatic motor OFF if it gets too hot / overloaded. Sold by Kayra Decor and ships from Amazon Fulfillment. Inalsa Wonder Maxie Plus V2 food processor is a user-friendly food processor. 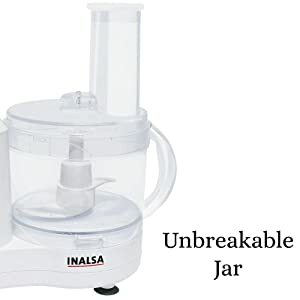 It is provided with a main 1.5 l polycarbonate blender jar, a 1 l SS dry grinder jar, a 400 ml stainless steel chutney jar, & 1.0 Ltr processing bowl. 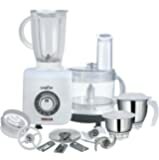 This food processor is with an extra powerful motor which can take 700 W Lod Continously for 30 mins. So you don’t need to worry for any food processing operation. 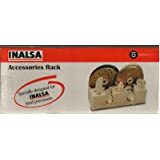 • The INALSA Food Processor is equipped with over load protector which protests its motor against sudden over loads by tripping the unit OFF automatically. 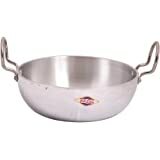 • Its bowl cover is designed such that even by mistake your hand can’t get inside. It Purees tomatoes/ Crushes Ice/ Minces Meat/ Chop Onions/ Chops Ginger Garlic & Chilies/ Chops Cauliflower/ Crumbs Bread/ Chops Palak & Other Leafy Vegetables / Missi Roti Atta/ Slices Cucumber/ Cuts Cabbages/ Slices Potatoes/ Shreds Lauki/ Shreds Carrot/ Shreds Raddish/ Grates Coconut & Gola/ Pulps Chikoo/ Kneads atta/ Mashes Potatoes/ Shells Peas/ Batter for cakes/ Salad Dressing/ Whisks Eggs/ Whips Cream/ Churns Cream for butter batter for Vadas, Idlis &Dosas/ Mango Crush/ Milk Shakes/ Onion Paste/ Dry Grinding for masala/ Lemon Juice/ Carrot Juice/ Orange Juice/ Coconut Milk/ Soup Straining & much more. How to start: First, have a look at the polycarbonate jar, it does not leave any kind of smell and it is unbreakable too. There is no fear of it getting break while it is dropped from your hands or your kids hands. This Appliance is totally safe. It has not 1 but 4 safety features. It’s cover is designed such that even by mistake your hand cannot get into it. Let's get to know how this Atta Maker Start. For this first you have to understand how the processing Bowl will fit on the main unit. 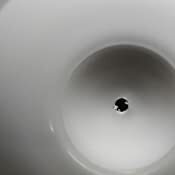 For fitting the Bowl on the main unit, match the marking given on the bottom side of the bowl with the lock given on the main unit, and rotate the processing bowl anti-clockwise to lock. To cover this hold the bowl cover from its feeder tube side, now match the bowl cover marking with the arrow marked on the bowl and rotate it anti-clockwise and lock. You have to keep this in mind that until the bowl cover is locked, the appliance will not run. To remove this, press release button and rotate clockwise. This reduces the danger of the accident. Until the blender side cover is closed properly, the processing jar will not work.This is an important safety feature. For starting the blending jar it is must to close the cover of processing jar. And remember never use blending jar & processing jar together. It also has an overload protector which automatically stops the appliance when it becomes too hot. Does it get really messy and problematic when you’re cooking food and you have multiple things to do at the same time? Does work load become a big worry for you in kitchen? 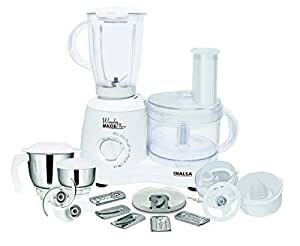 Inalsa Wonder Maxie Plus V2 food processor can perform functions like chopping, mincing, kneading, grinding and juicing effortlessly. The 6 segmented cutters and the centrifugal and citrus juicer that comes along with it further adds to its utility and functionality. Moreover, it also comes with a chopper, egg whisker and Atta kneader. 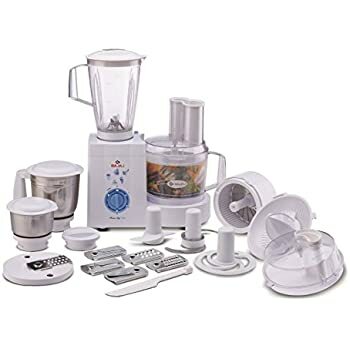 The blender jar, multi-purpose grinding jar, dry grinding jar and chutney jar provided with this food processor will help in making your kitchen work easier. It Purees tomatoes/ Crushes Ice/ Minces Meat/ Chop Onions/ Chops Ginger Garlic & Chilies/ Chops Cauliflower/ Crumbs Bread/ Chops Palak & Other Leafy Vegetables / Missi Roti Atta/ Slices Cucumber/ Cuts Cabbages/ Slices Potatoes/ Shreds Lauki/ Shreds Carrot/ Shreds Raddish/ Grates Coconut & Gola/ Pulps Chikoo/ Kneads atta/ Mashes Potatoes/ Shells Peas/ Batter for cakes/ Salad Dressing/ Whisks Eggs/ Whips Cream/ Churns Cream for butter batter for Vadas, Idlis & Dosas/ Mango Crush/ Milk Shakes/ Onion Paste/ Dry Grinding for masala/ Lemon Juice/ Carrot Juice/ Orange Juice/ Coconut Milk/ Soup Straining & much more. 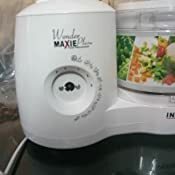 The multipurpose jar in this Inalsa Wonder Maxie Plus V2 food processor is made of polycarbonate material. This material makes the jar unbreakable. Now you don’t have to worry if you drop the jar by mistake, it’s unbreakable. Power overloads may damage your electrical appliances. This food processor from Inalsa home appliances is protected against the sudden overloads. In case such a situation occurs, then your food processor will automatically turn off. 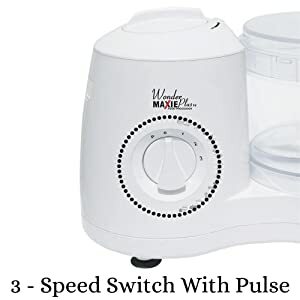 To restart the unit, wait for 2-3 minutes to allow the motor to cool down and remove the cause of overload and press the button located at the bottom of the mixer grinder and you are good to go. 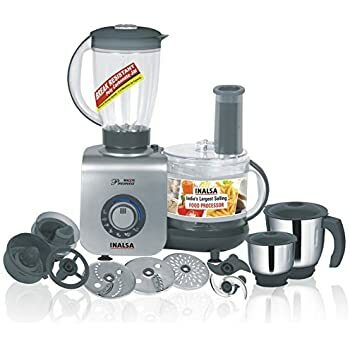 This Inalsa Wonder Maxie Plus V2 food processor has a 3 speed rotary switch with inbuilt pulse function. You can process your food using three different speeds. Also, pulse function is present. For pulse function simply turn the switch to left. 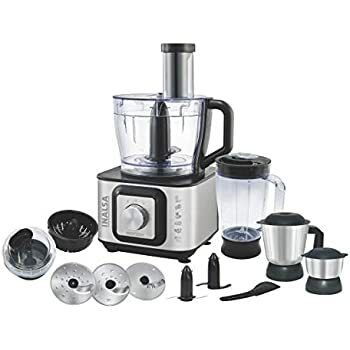 Inalsa Wonder Maxie Plus V2 food processor is a user-friendly food processor. 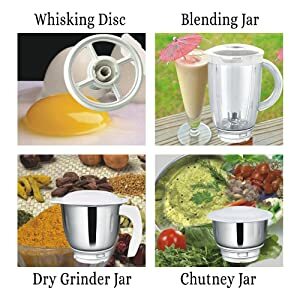 It is provided with a main 1.5 l polycarbonate blender jar, a 1 litre stainless steel dry grinder jar, a 400 ml stainless steel chutney jar, & 1.0 Ltr processing bowl. So, you can blend or grind quite a good amount of ingredients in these jars at a single time. Despite this large capacity the food processor has a compact design which will not take up much space on your kitchen slab. 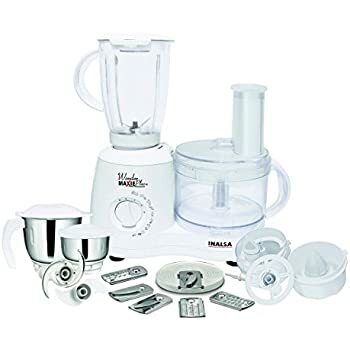 Inalsa Wonder Maxie Plus V2 food processor comes with 2 blades and 2 juicer attachments. Talking about blades, one is the plastic blade and the other one is chopping blade. Chopping blade (purees tomato/crushes ice/minces meat/chops onion, garlic, ginger and chilies / crumbs bread etc.) the plastic blade (kneads atta /mash potato/ shell peas etc.). 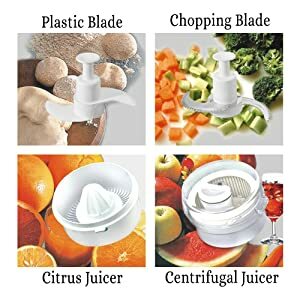 The juicer attachments are citrus juicer (for lemon juice, orange juice, mosambi juice) and centrifugal juicer (for carrot juice, coconut milk, soup straining etc.). 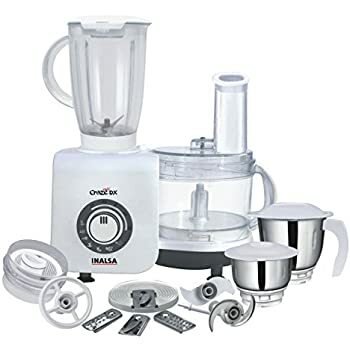 The Inalsa Wonder Maxie Plus V2 food processor has been fabricated to perform operations with 6 functional Cutters that allow any kind of kitchen operation to be done with ease, comfort and in very short time. Fine slicing cutter & coarse slicing cutter (slices cucumber, cabbage, potatoes etc.) , fine Shredding cutter & coarse shredding cutter (shreds carrot, mooli, lauki etc. 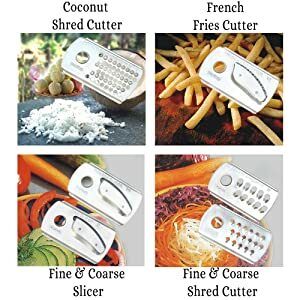 ), french-fries cutter (slices potato for French fries),coconut shredding cuter (grates coconut, gola , pulps chikoo). Please stop dealing in such cheap products. 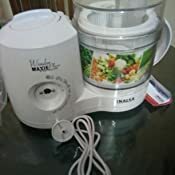 I bough one food processor of Inalsa earier about 15 year back which gave me nice service for about 10 years and it is still being used by our maid in her house. Now the current product I bought (supplied on 5th March 2018) though does not carry any grantee but warranty of 2 years (5 years on motor) wherein it is understood that the manufacturer do not expect any defect at least in two/five years. Astonishing to note that juicer got cracked where pin of its cover rests within 1st month. Again its motor coupler also broke and both got replaced/repaired today (23.03.18) by customer service. THE MECHANIC WHO ATTENDED WAS NOT CARRYING ENOUGH (PROPER) TOOLS TO REPLACE/REPAIR AND KEEP HITTING THE MACHINE MERCILESSLY. WHEN INQUIRED HE TOLD THAT COMPANY DO NOT PROVIDE EVEN THE TOOLS HE WAS CARRYING. 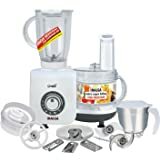 It may further be noted that the food processor is so designed that it works in a fool proof manner and there is no chance that user can commit a mistake to harm it. Its workmanship is so crude that apparently appears some Chinese street product. 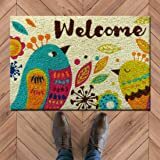 Today I contacted your customer service that insisted the to avoid defame to AMAZON take up the matter with concerned official to minutely review products of this company and stop dealing in. She insisted to provide contact number of the manufacturer so that I should take up the matter with them. 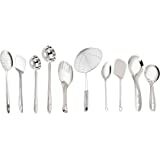 I KNOW THAT MANUFACTURER PARTICULARLY THE INDIAN WILL NEVER AGREE TO MY OBSERVATIONS AND IF I GENUINELY BECOME SUCCESSFUL SO THAT AMAZON SHOULD STOP DEALING SUCH PRODUCT THAT WILL NOT ONLY PROVIDE ME FULL SATISFACTION BUT ALSO PROTECT REPUTATION OF AMAZON. I DO NOT MIND THROWING THIS PRODUCT STRAIGHT AWAY IN MY DUSTBIN TO BYE PEACE NOT SEEING TO IT IN FUTURE. I AM REALLY SORRY THAT THIS LADY PURPOSELY DISCONNECTED PHONE. PLEASE REPRIMAND THIS LADY AS WELL AS TAKE THIS MOST IMPORTANT ACTION ON YOUR PART SO THAT OTHER MANUFACTURERS CAN ALSO TAKE LESSONS. I DO HOME THAT SUCH ACTION WILL DEFINITELY ENHANCE REPUTATION AS WELL AS SALE OF AMAZON. PLEASE TAKE THIS ACTION AFTER TOTALLY SATISFYING YOU ABOUT POOR QUALITY OF PRODUCTS OF INALSA AT PRESENT WHICH WAS ONE OF THE BEST PRODUCTS IN PAST AS INDICATED ABOVE. PLEASE DO KEEP POSTING ME ABOUT THE ACTION. REGARDS. I purchased food processor because of faith on amazon and cloudtail. After opening the box I found that Switch knob of food processor was loose and When I tried to rotate this it was in my hand. I purchased two processor simultaneously, one for me and one for my brother in law . When I made a request to company they respond in time and send technician. And he has changed damaged part. Now I can say Service of inalsa is good. Defective demo DVD given!! Unplayable simply in any player! I had to download the demo video from youtube. Quite impressed by it!! Impressed by the number of safety features. This model contains virtually all type of attachments with which you can do almost anything. Nice material also...with which it is made. I am quite satisfied and happy to buy this this Wonder Maxie plus V2. It got delivered in just two days! !...and that too in a top class packing!! Great job! I think it is more of a fancy gadget that can be presented in school science club exhibitions. To be more precise, I should cite the reasons as well. The juicer-shredder-grater part of the mixer is almost useless for my mother in kitchen. This is how I got coconut grated using the coconut grater blade. (Please see the photo) If you are satisfied with this type of grating, you can go for this product. And, if you are looking for a juicer, I would advice to go for other products in the market. Unlike the way we are used to, all the locking is accomplished when we turn the bowls anticlockwise. This is not a big problem, as we may get used to. The problem is that, it takes a great deal of effort to get the things locked. The plastic parts are of inferior quality and I think it will not last for long. The build quality is very poor as you can see from the attached photos. 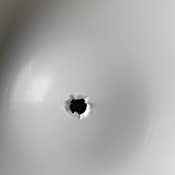 See the way a hold is drilled on the plastic lid of the jar! The chutney jar is comfortable and does its job. Another draw back is that the juicer part of the machine works unnecessarily while you are making chutney or some other jobs with the jars. Final verdict: If you are serious, this is not the product for you. Day 1 I used this and the knob to control speed came off . Now the entire thing is useless as I cannot control the machine . It came off just when I turned it slightly . Called Inalsa Customer Service since a week and they said someone will come tomorrow and they never do . 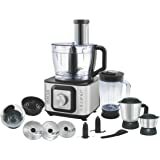 4.0 out of 5 starsGood food processor..a must buy! 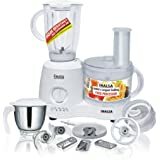 After lot of research on food processor i finalised this product, because of the motor watt and the number of jars n blades. Also the reviews were good . Have been using it since past 10 days. Overall quality is good and sturdy. This processor has made my life easier ,saving lot of time. Atta kneading gets a bit messy if you want a little soft dough. So trick would be to knead hard dough and you can make it softer by hand later on. Though i used big potatoes but the french fries i got was small in size.Little disappointed by this. Also do not try to blend anything liquid in small chutney jar, it will spill out. I tried blending curd in small jar as quantity was less ,but the curd came out even though i was holding the lid.